Greek On The Street came about by two people’s love for food and life after realizing that authentic Greek cuisine cooked at home was better than anything in restaurants. We wanted to have people try our food. With the nationwide food truck boom we quickly realized this was our best route. Our goal was to make the most amazing Greek food and serve it off a FOOD TRUCK! Greek on the Street became a hit quickly. We have a phenomenal following in downtown Baltimore and Anne Arundel county within three years. 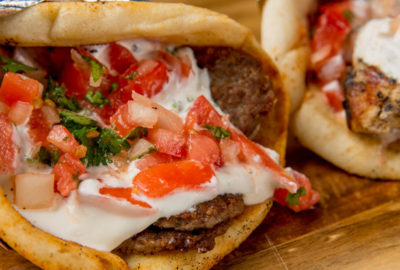 Greek on the Street has 5 food trucks and a catering business. We owe it all to our loyal customers. There is nothing better than seeing people really happy to see you. People travel long distances by car, or walk several blocks because they love our food. There’s nothing better than doing what you love for a living. Offering a variety of delicious wraps, platters and salads Using our prepared marinated meats, seafood and vegan options. All salads served with mixed greens, lettuce, peta, kalamata olives, tomato, pepper, onion, pepperoncini & our homemade greek dressing.